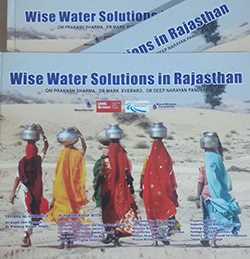 'Wise Water Solutions in Rajasthan' is a first of its kind publication, which in detail, documents the enormous range of Water Harvesting Structures (WHS), which are still in use in Rajasthan to harvest rain water, its access and use efficiently. The purpose of this book is to help communities identify the kinds of water harvesting solutions that match their specific geographical and cultural contexts and needs. The book argues that the specific types of WHSs found across Rajasthan differ depending on the physio-topography of the region, geological conditions particularly including permeability, extent of local rainfall and cultural differences. The different structures are optimal according to slope, soil structure, and the village needs. Like in the Aravali Hills of Rajasthan the focus is to hold back rain water flow to allow it to percolate into the ground and thus recharges the wells. In the Thar Desert where the water percolates straight through the sandy soil and is lost, the focus must be on water storage. The book is designed to help people to understand the wisdom, purpose, function and diversity of WHSs and other water-wise solutions, and to select those that are most appropriate and most self-beneficial in different situations. There are notes on each type of WHS, including brief guidance on construction and management requirements. The book also documents modern solutions to harvest and improve use efficiencies and argues that ancient solutions alone may not be sufficient; the challenge is to integrate and perhaps develop further traditional structures with modern solutions. Click here to download a few pages of the book. Water law regime in the state of Rajasthan includes many laws, and extends its span to many different sectors. Different sectoral laws deal with different aspects of water resource and its management. Existing laws have not been able to fully address the emerging challenges of water sector and related conflicts. In today’s context, the first and foremost problem is existence of multiplicity of laws made with different objectives, weak in terms of protecting the health of resource and fails on account of equity, efficiency, conflict resolution and sustainable use of the resources. 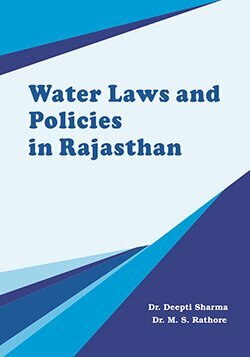 This book is an outcome of a comprehensive research done by author on all the old and new existing water sector laws and policies in Rajasthan. It throws light on the present water scenario in Rajasthan, legal framework, emerging issues and attempts to understand various historical, international and national perspectives of water law. The book also analyze whether the current legal regime has been effective in regulation and management of water resource in the state. Book also advocates for making all the related laws water centric instead of enacting new laws, harmonize the water sector laws with the recent National Water Policy, State Water Policy and the newly introduced principles of the policies trying to bring a new approach to the legal regime for water management.